John-David Duggar once famously proclaimed that he was going to be a “Bachelor until the Rapture” but the Counting On star obviously had a change of heart. John-David, the third oldest child of Jim Bob and Michelle Duggar, married Abbie Burnett on Saturday in Abbie’s native Oklahoma. The happy couple– who announced their engagement in July, following a one-month-or-so-long courtship released the standard “Married Duggar Kid Post-Wedding Statement. Us Weekly also released the first wedding photo of John-David and Abbie, showing John-David beaming (which, as ‘Counting On’ fans know, is rather uncharacteristic of the mellow Dug), and Abbie wearing a conservative yet sleeveless (!) white gown and a rhinestone-encrusted veil. The wedding was held at Ada First Baptist Church in Ada, Oklahoma, at 2 p.m. (according to their leaked wedding invitation). 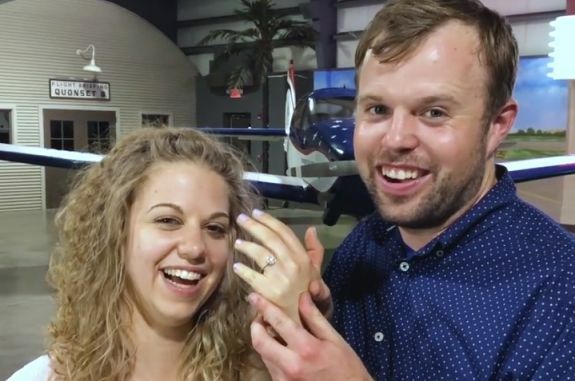 The reception took place at the Hoppes Airplane Hanger (which is fitting, considering John-David is a pilot and proposed to Abbie in a hangar). The hangar was decorated with photos of the happy couple, as well as a weird “photo wall” of giant flowers. Guests were served chocolate milk because….Duggars. It seems that the couple also served a breakfast buffet— cereal, waffles, etc.— despite the fact that it was an afternoon wedding. No photos of the bridal party have surfaced yet (although we can almost surely expect at least some of the Duggar girls to have been bridesmaids…wearing random sandals). It appears that Bringing Up Bates star Nathan Bates served as a groomsman. On Saturday, Ma and Pa Duggar released a statement about the wedding to their official website. John-David and Abbie, at 28 and 26, respectively, are the oldest Duggar offspring couple to tie the knot. Both are significantly older than the rest of the Duggars and their spouses on their wedding days (except for Jinger‘s husband, Jeremy Vuolo, who was 29 when he got hitched). With John-David married, that leaves only a few Dugs who are of marrying age and still single. John-David’s twin sister, Jana, is still unwed (at 28, much to her father’s dismay). 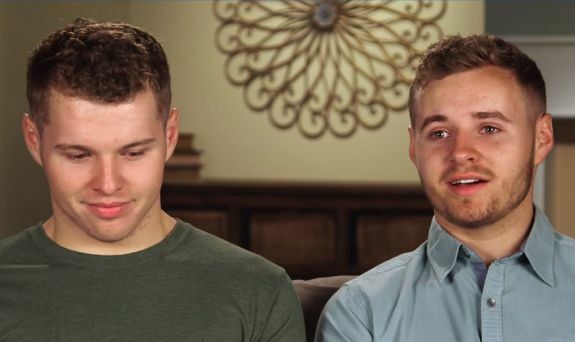 John-David’s 19-year-old twin brothers Jeremiah and Jedidiah, as well as his 18-year-old brother Jason, are also still single. TLC has announced that John-David and Abbie’s wedding footage will be featured on the TLC GO app on November 20, and will air in a wedding special on November 27 on TLC. Watch the happy couple talk about their wedding in the video below! Wanna get all the stats on the previous Duggar weddings? Click here to read The Ashley‘s “Duggar Wedding: By the Numbers” post! I am so happy for him, he is the only Duggar who put his foot down and had a normal relationship and that was not by the Duggar’s rules. The have dated privately for a year with out chaperones, and Abby went to college to become a nurse and worked as once as well. There is no crime in saving yourself for marriage and being a Christian. If Abby wants to quit nursing and become a housewife that is ok because so all ready has so much life experience more then any of Josh’s sisters will ever have in their lives. Best of luck to the happy couple. I didn’t realize they dated without a chaperone, good for John David !! Did John David forget his comb that day? Why would he need to comb them if they will be messy by the end of the day? I’m sorry for the mental image. They look at each other like they’re totally in love – not in the creepy silent way all his sisters look at their husbands. So happy for them! The only Duggar marriage I can actually support. Now it’s time to find his twin sister a husband, come on JB, it can’t be so hard, let her go already! I feel sorry for her. He’s an idiot. Surely she could have done better. Breakfast for dinner really isn’t weird at all. My mother used to do that for us sometimes. Abbie, I bet you are going to keep your job. Congratulations! First off, I’m not a big fan of the Duggars but these two seem like they are genuinely happy. How do you not root for JD?? Aww! I don’t think I’ve ever seen John David look happy until now. Abby looks beautiful! Why is anyone who is on one of these shows considered a star? They’re just part of the “Cast”.